When Kayla Wingard comes home from work, Ellen jumps up to greet her. “She’s sweet, like a little puppy,” said Wingard. But Ellen is decidedly not a puppy. She is a brown rat, one of two that Wingard adopted when she was working for the Discovery Place Science Museum in Charlotte. Ellen, along with her “sister,” Portia, were at the end of their time as part of an exhibit when Wingard took them in. The pair moved with Wingard when she relocated in August of 2017 when Wingard changed jobs. Wingard has a soft spot for animals — all animals. The weirder, the better. Ellen and Portia entered a lineup of past and current pets that includes a sugar glider and three cockatiels — and, yes, even a dog. Currently, it’s just Ellen and a cockatiel named Guava. 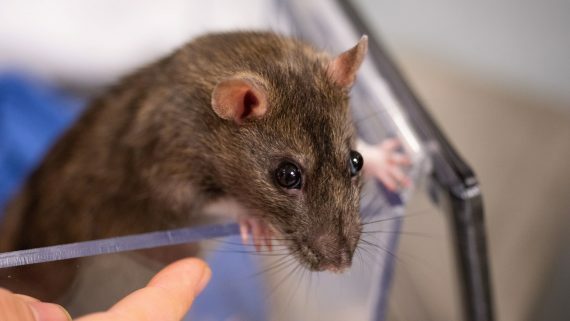 Rats, like most small rodents, have a short life span — two to three years on average — and Portia has passed away. Ellen soldiers on, however, with the assistance of the NC State Veterinary Hospital and the Petco Foundation. Last fall, Wingard noticed a swelling on Ellen’s abdomen. 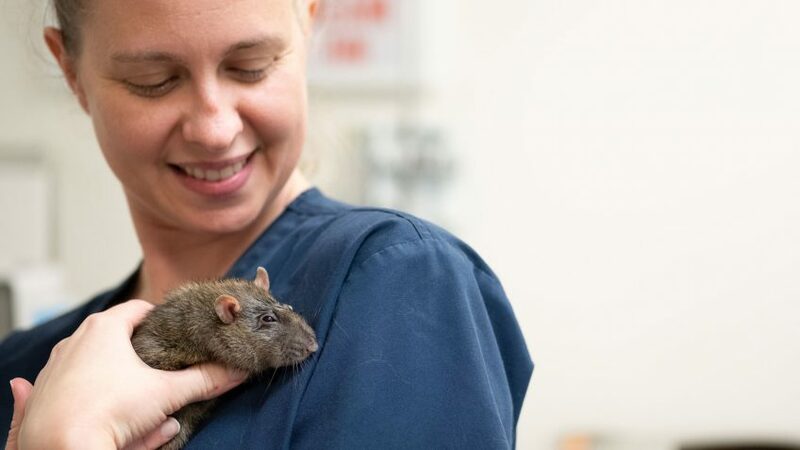 Her primary care veterinarian identified it as a mammary tumor, a common problem for brown rats. Wingard agreed to have the tumor surgically removed, but Ellen has a particularly aggressive form of cancer. One tumor became many, involving an increasing number of surgeries. It was time to find an alternative approach. 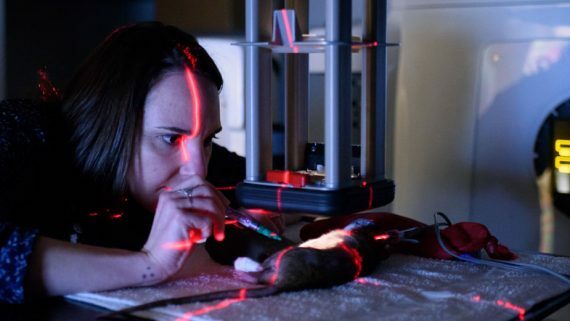 When she brought Ellen to the exotic animal service at the NC State Veterinary Hospital, Wingard said she found a dedicated medical team, headed by clinical assistant professor Tara Harrison, that took the time to explore multiple options and discuss the case with her thoroughly and compassionately. At last, there was a way forward. A series of weekly radiation treatments over four weeks would shrink the tumors and extend Ellen’s life while keeping her comfortable and happy. Even with this treatment approach, costs can still be daunting, which is why Wingard has greatly appreciated the financial assistance from a Petco Foundation grant. The Petco Foundation has awarded multiple grants to the NC State College of Veterinary Medicine to help defray the cost of cancer treatments for companion animals. These funds not only help owners and their pets, but support the practical learning experiences that advance veterinary medicine. For Wingard and Ellen, NC State and Petco have made a dramatic difference. Ellen is feeling great, said Wingard, and her tumors have gone down drastically in size.